This pattern is part of a Halloween themed set I've designed this year which includes a Pocket Ghost, a Bat and a Frankenstein doll. The first 2 are already available, the doll will follow. If you use the same yarn and hook size given in the supplies list then you should get a grumpy pumpkin about 2 inches tall. crochet the bobble nose onto the face. How to add the eyes, mouth and eyelids. How to sew the stem in. If it not displaying above, the video is here. Please give the video a thumbs up if you find it helpful! 2-3) 1sc in each st for 2 rows. Of course you can add more rows of sc to make a longer stem. To have stackable pumpkins then only do the 2 rows of sc. f/o leaving a tail for sewing. Sew to the top of the pumpkin after you decorate the face. You can use 2 pipe cleaners, folded over and twisted, inside the stem to make it poseable. Or lightly stuff it instead. 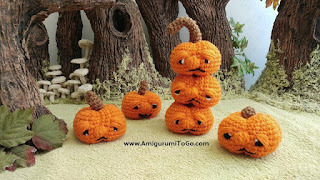 Sew to the top of the pumpkin after you decorate the face. f/o leaving a long tail. Weave in and out of the remaining stitches, stuff more as needed and shape as you stuff the bottom of the pumpkin. Pull yarn tail to close the gap and knot off. Bring the yarn needle through the center, from the bottom to the top, then wrap around the pumpkin, bring the needle through the center, from the bottom to the top again, and pull tight. Repeat until you have 4 even sections. Knot off. If the yarn tail is long enough you could use it to make the nose, if not then hide the yarn tail inside the body. Bobble Nose: with orange The nose gets crocheted beside one of the 4 lines. Turn the pumpkin upside down, insert your hook under row 9, just on the outside, to the right, of the dividing line. Ch1 then make a bobble using 5dc, going under the 9th row each time you pull up yarn. To make a bobble, yarn over your hook then go under the 9th row, grab the yarn and pull it through, now you have 3 loops on your hook, yarn over and pull through the first 2 loops only, now you have 2 loops remaining. Leave those loops on your hook, yarn over, go under the 9th row and repeat the same steps over until you have 6 loops on your hook. Yarn over and pull through all 6 loops. f/o. Hide starting yarn tail then bring the finishing yarn tail through the body, pulling the nose in place, knot off and hide yarn tail inside the body. Bring the yarn down through the top of the pumpkin, where the stem will get sewn on, and out in between the 9th and 10th row. Wrap the yarn around the 9th row with 1 or 2 visible stitch holes between the eye and the nose. I wrapped the yarn 3 or 4 times for each eye. Once done with the eyes, bring the yarn tail out in between the 11th and 12th row, starting at the corner of the mouth. Make any type of mouth you prefer, happy or grumpy. Add white yarn to each eye. Placement of the white yarn will change the look of the eyes. Once you are done with the eyes and mouth, knot the yarn tails together at the top, where they will be hidden by the stem, then hide the yarn tails in the body. Wrap orange yarn over the eyes on a slant. I wrapped a number of times until I was happy with the look. You can knot off the yarn tails anywhere on the pumpkin then hide the yarn tails inside the body. I hope you enjoyed making a little pumpkin. I would love to see it! 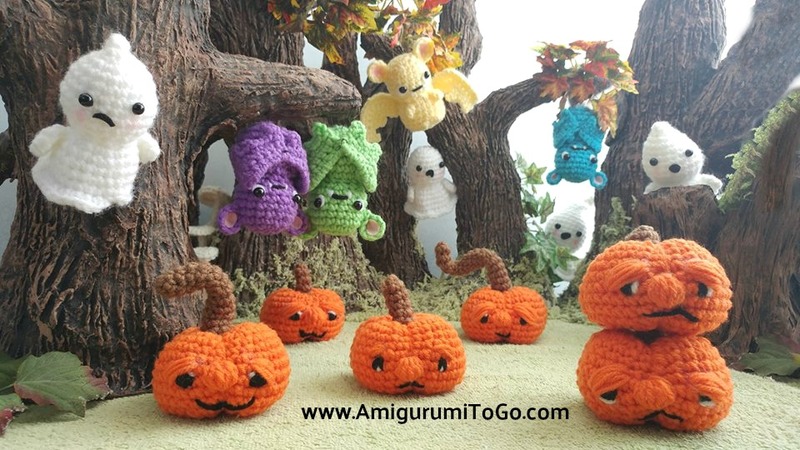 Post on instagram and tag me sharon_ojala or post it on my facebook page Amigurumi Freely.